As a mom of 3 busy kids, an Army wife, MBA student and eventually a career woman, life had taken on a role of its’ own. I had become well accustomed to putting everyone else’s needs ahead of my own. Life had become so fast paced that quick meals had become normalcy around our home and my body quickly showed the results of what happens when you have no time left to take care of yourself. Then the opportunity came for me to follow a long time dream, I was going to get the opportunity to serve my country overseas. So two years ago I was getting ready to deploy to Afghanistan as a Department of the Army civilian. It occurred to me that this might be my only chance to take some time to focus on myself and my own health, which seems strange given I was heading into a war zone, but to me my health was a war zone. I hit the ground in Kabul, Afghanistan on 11 November 2015 weighing in at 180 pounds. I was fortunate to make friends with my Sergeant Major and my roommate who became my regular workout partners. A SFC in our unit helped to put together a workout plan and eating plan that was in line with my goals. On the trip from Bagram to Kabul I was incredibly embarrassed at how difficult it was for me to wear all my gear and to try to carry my bags. My main goal became to be able to carry my own bags when I left country to redeploy to the US in 5 months. Every day in the gym, while looking in 360 mirrors, I fought back tears. Yes, even in Afghanistan some of the gyms had full surround mirrors. I had to remind myself that each day in the gym was a victory. Inches started to come off and pounds came later. I alternated 4 weight routines along with cardio. When I got there I could walk 1 mile in 20 minutes. When I left I could run 2 miles in 22 minutes. I can 100% tell you that this was by the Grace of God and by always telling myself “I can do this!” By the time I left Afghanistan I was weighing about 145 but had a horrible case of planter faciaitis. I had successfully lost 35 pounds with the help of some friends. By the end of my time in Afghanistan I worked out on my own as my prior workout partners were not as dedicated as I was. I was able to carry my own bags but had made so many friends that they refused to let me carry them. I returned to the United States at the end of April of 2016. In July 2016 I went on vacation with my husband and kids and by day 2 had debilitating stomach pain. Nausea set in as well but I didn’t want to ruin my family’s vacation. I assumed it was ulcer related, called my Dr who called in a prescription to the pharmacy where we were staying. I started finding that I couldn’t eat hardly anything without my stomach twisting in knots. 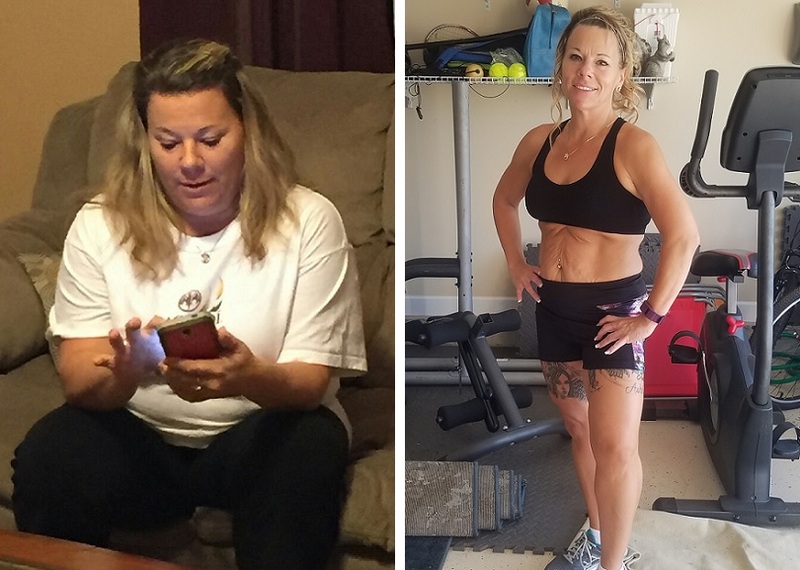 To shorten this story…the Doctors eventually found that I had detoxed while in Afghanistan and in returning to the United States I had began to retoxify my body with the foods here. Slowly we began to learn what foods were causing a problem. This also derailed some of my progress and kept me out of the gym for several months. As most know, even a week out of the gym, you lose gains quickly. Fast forward to November 2016 when I moved to North Carolina from Wisconsin for a new job. My family and I were in a hotel for 60 days almost before we could get into our home so attempts at working out in the hotel were made but holding my weight steady were made 90% based on diet. Still overweight my frustration grew and in February I was finally able to join 4ever24 fit. While I was more motivated than ever to lose the rest of the weight and get back into shape I knew that there was no way I could do this alone. Thankfully I didn’t have to. Adding a trainer was just what I needed to get back on track. Walt has been absolutely amazing and as dedicated as I have been at achieving my goals. He listens to what I want to achieve and continually adjusts my workouts to help me meet those goals. Add to the mix the fact that my marriage did not survive the move to North Carolina so I am now a single mom raising 2 kids, one is now an adult and is moving to Alaska to spread her wings and fly. That brings it’s own stress. I have managed to drop down to 128 and am closer to my goal than ever. I don’t know where I would be without my 4ever24 fit gym family! November 2015, I was sitting in my doctors office stunned and ashamed. My blood pressure was 220/116, I felt tired all the time, my weight had soared to 256lbs and I was miserable. I had been in a position in my career that was very demanding as well as an unhealthy relationship and it hit me like a brick wall. I decided it was time to make life altering changes. I immediately requested a change in my position with work and developed a plan that would fit my lifestyle. I had been a member at 4everfit for a couple of years, but without dedication it was useless. I remember being embarrassed to workout during the day and thanks to the 24 hour schedule at 4everfit I was able to go at night when minimal patrons were present. After I dropped the first 30 pounds I approached Walt who is a personal trainer. I knew if I wanted to be successful and in order to do that I needed to build muscle. We began working together 2 times per week in February of 2016. Without that I don't think I would have succeeded. He is sincere in his dedication to his clients and takes the time to arrange workouts that are specifically designed for the individual. We discuss nutrition and resources to assist with accomplishing goals. To date I have lost 70lbs but I have found a confidence that is irreplaceable. My body has been completely reshaped. Every week is a new challenge with Walt, and I look forward to each and every one. When I walk in the gym I feel at home with Sandra cheering me on, and Walt pushing me to new heights that I am excited to see where I'm at this time next year! When 2016 started, I knew I needed a change. I was turning 40 in August and I did not want to look and feel the way I was feeling when it got here. I was tired and sluggish. I was unhappy with how I was living my life, in a very unhealthy manner. I am a wife and a mom to two sons. I wanted to have the energy to keep up with them. I wanted them to be proud to say, “That’s my mom!” I just did not feel like I was living the best I could. I re-joined 4ever24fit (I was a member years ago but cancelled my membership because I could not find the time to make it to the gym) in February 2016. I came a few times and got on the cardio equipment. The changes I wanted to see were not coming to me. 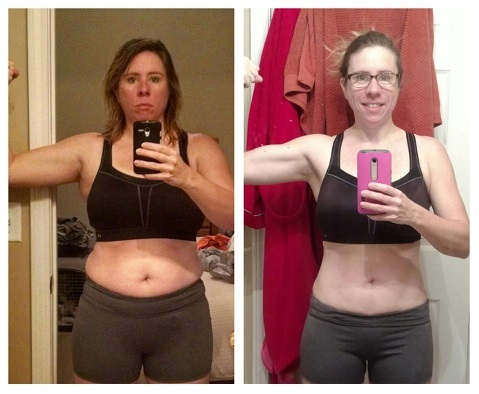 I wanted to not only lose weight; I wanted to get stronger. I knew my best chance was to hire a trainer. I needed accountability. I needed to be pushed in a way that I could not push myself. I needed to learn more about getting stronger and needed to learn to be confident in the gym. For Mother’s Day 2016, I asked for sessions with a trainer from my family. My 40th birthday was just three months away. I signed up for five sessions with one of the gym’s trainers, Kate Mann. She began to whip me into shape. The first session was one of the hardest days I have had, physically, in a long time. I laugh about how I fell into my car that day because my legs were pure Jello. And then I came back for more. Then I signed up for another five sessions. Kate was patient with me. She always had kind words along with tough love. She taught me that, as a woman, I did not have to fear going into the weight room; that I could walk right in there and be confident about what I needed to get done that day, and do it. She guided me through and helped me establish a routine. She got me hooked on the gym and the endorphins that come from a good, hard workout. When my 40th birthday rolled around, I still was not exactly where I wanted to be. However, I was well on my way. Getting healthy entails a lot of things. It is not just about losing weight. It is also about building muscle and strength, finding an inner strength, learning balance (the core kind and the emotional/mental kind), and learning to give yourself grace. I stand a little taller these days. There is a confidence that I found on the gym floor. I learned that it is okay to take care of myself and that is not selfish to do so. I am a better wife and mom because I take care of myself. The gym has become a source of sanity for me. I need breaks. I have learned to “work it out” at the gym, sometimes on a piece of cardio equipment and sometimes lifting. 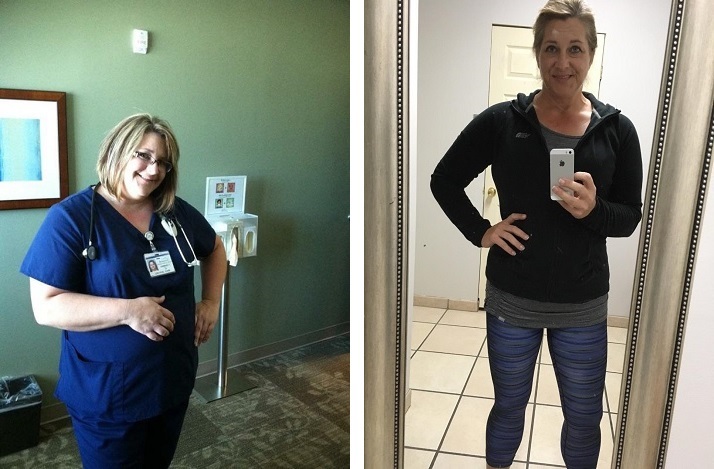 In September of 2013, I found myself sitting around a table with a group of people listening to a doctor explain how our life would change once we had gastric bypass surgery. Although he showed charts that depicted the “success” of the surgery, he spent most of the time discussing the steps we would have to take to reach that success. Not only would we spend the rest of our life taking vitamins to make up for the nutrients we didn’t receive from the measly 600 calories our stomachs would only be able to absorb, but we would also have to refrain from drinking any type of liquid with our meals because it would take up too much room in our stomachs and reduce our caloric intake even more. Further, he suggested that we go ahead and start practicing counting every bite 35 times before the surgery so that we would be in the habit of doing so with every bite after the surgery. This ensures that the food isn’t too difficult for our stomach to digest. While most people left the consultation seemingly overjoyed, I was terrified and definite that I would not be having surgery. Approximately 2 weeks later, I walked into my first Zumba® class. The only clear thing I remember from my first time is E.L. Morea, the instructor announcing, “This is not a dance class! If you are moving, you are burning calories!” For several days a week for the past 18 months I have done just that… I have moved with Zumba®. And as of today, I have lost 104 pounds. Any time I have ever tried to lose weight, I have always had the mindset that my goal was to be skinny. 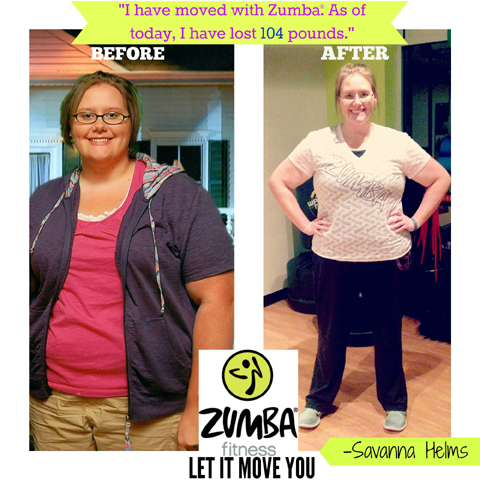 Zumba® has taught me that skinny has nothing to do with being healthy. It has taught me that strength is something to be sought, not a specific number on a scale. For me, strength has come not only from the pure physicality of Zumba® but also from the amazing group of “Zumbies” I share 3 hours a week with. These individuals are the greatest cheerleaders, supporters, and friends anyone could ever ask for. I am grateful God led me to them. I wish I could go back to that day at the doctor’s office. I wish that I could tell those people sitting at that table how I felt then and what I know now. Wherever they are, I hope they have found their own strength. If you ask my friends they will tell you that I invite everybody and anybody to Zumba®. Most of the time I get the same response… “I have no rhythm.” That is the beauty of it! Most of us don’t! We miss beats, add turns, sweat like crazy, make up our own moves, and go through several gallons of water each hour. We are a mess, but we are a beautiful mess. I want everybody I know to be a part of it.